Experience your favourite movies in breathtaking detail with the Samsung BD-J4500R Blu-ray player. Delivering an unimaginable picture quality, the BD-J4500R lets you enjoy true-to-life images. Support for a large number of codec and file formats means you can access and enjoy a wider range of video, image and audio content than ever before. 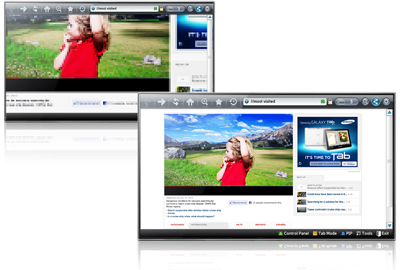 Many popular video formats such as Flash Player compatible and QuickTime are supported, as well as VOB files from DVDs. In addition to MP3 audio, you can listen to lossless FLAC files as well as .WMA and more. Pictures can be viewed in the popular JPEG picture format. With the Samsung’s BD Wise Web feature, you can watch Web-quality videos in high definition 1080p on your TV*. It automatically optimizes Internet videos by boosting picture quality so that images are crisp and any text is legible. BD Wise Web can even resize the video ratio* so that the edges aren’t cropped off. Access your multimedia with great connectivity**. 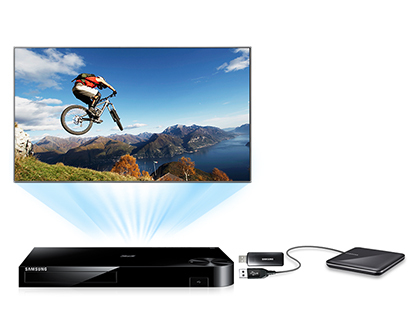 Sync and enjoy movies, photos and music on from your USB memory drive or external hard drive. External HDD Connectivity allows you to connect your external storage directly to your Blu-ray player via USB and quickly access video, audio or images. It’s designed to handle a wide range of content, so you can enjoy most of your home movies, downloaded music and holiday photographs all in the comfort of your living room. Just connect, sync and enjoy. Save time and hassle by optimising your picture quality with BD Wise. It automatically syncs your HDMI-connected Samsung devices, ensuring you’re your experience is simply stunning.